I love stripes that is no secret. They are so versatile; you can dress them up or down, make them the focus or blend in, they come in so many cute styles, you really can't have too many striped tops. Moral of the story. 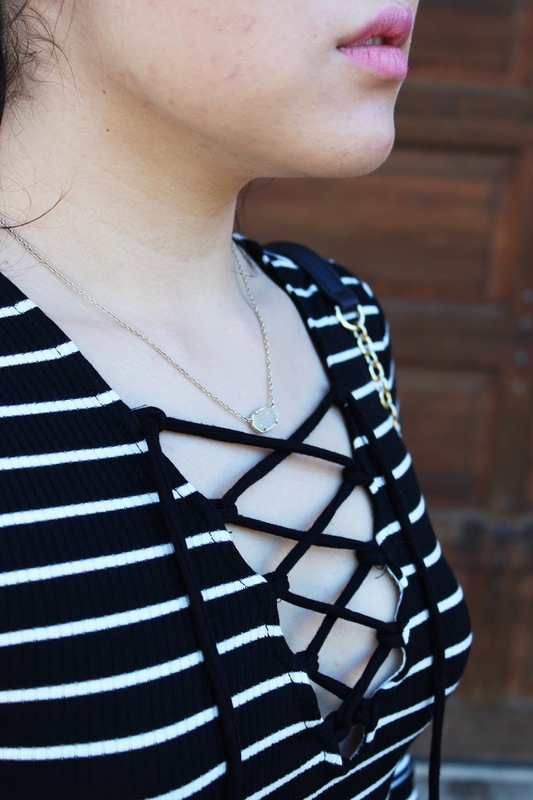 So when I saw this one on Forever 21 for under $15, with the cutest lace up front (super trendy right now) I knew I had to have it. This top is so soft and super strechy! It's definitely very body hugging so if you want it loose I'd size up at least two sizes. It is a shorter length, not quite crop top length but pretty close to it. It's gonna be so versatile with high waisted jeans or shorts for the summertime. And it comes in two other colors! I bought this skirt back in the fall of last year and just never had time to style it but it's gonna be SO PERFECT for spring! It's sadly sold out :( But I linked a similar style. 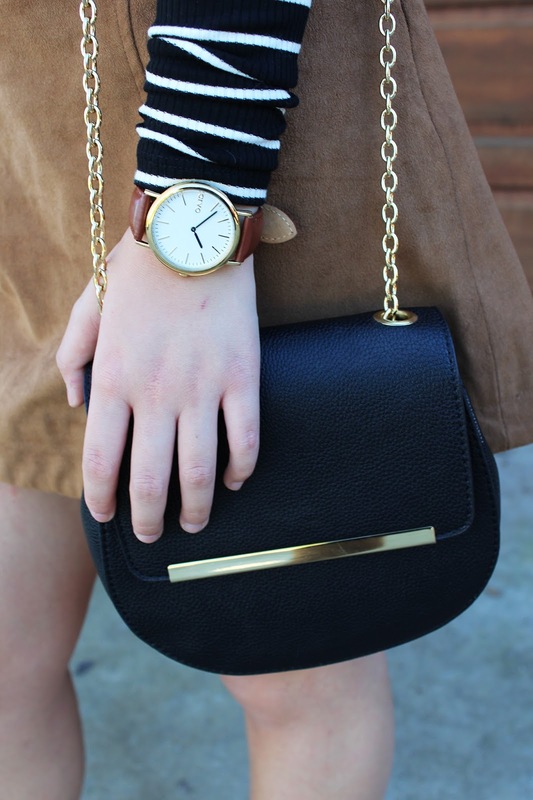 Lastly, I don't think I've ever shown my watch on here formally so here we gooooo! It was on my Christmas list and low and behold it was sitting under the tree. Dad you're the best!!! It's from the brand Arvo and is such amazing quality. It's got a bigger watch face than normal, which I prefer, the prettiest brown band and is gold. The trifecta of watches for me. And the bestest, best part? It's $70. YEP $70 FOR THIS BEAUTY! When I first saw this watch on Instagram I figured it'd be $125-150 like most are. I think I had an aneurysm when I saw that it was $70. If you're looking for a really classic, versatile watch that won't break the bank go check out Arvo! 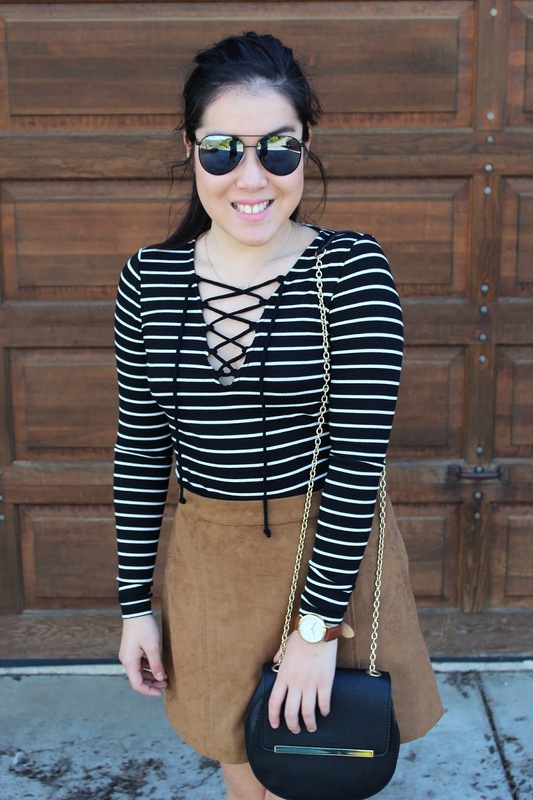 How do you wear stripes or suede? Share in the comments below or tag me in a photo, @samantha_goble! Great look! 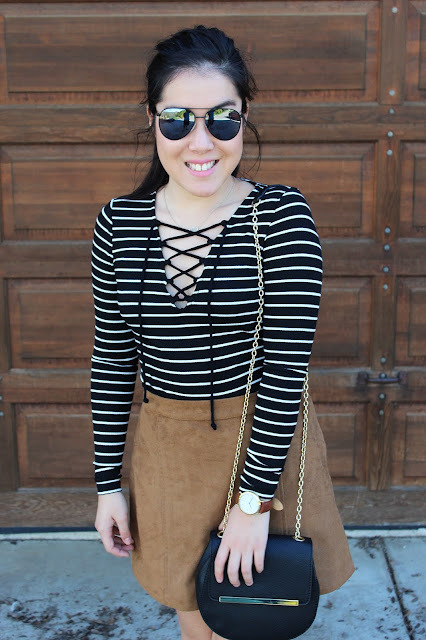 Love the lace up top! Thank you! I love this top too! It's gonna be so versatile!